Bodysuits are back for Spring! You read it here first. So I was preparing a shopping list for my Spring wardrobe, you know, and I quickly realized that it was clearly missing...more extravagant pieces! 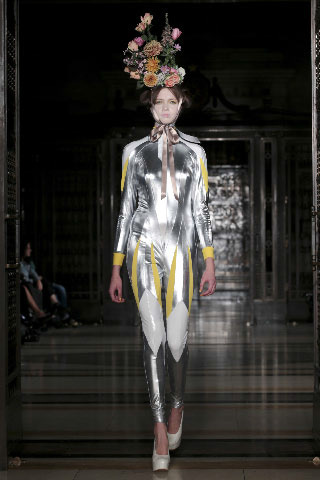 I spotted this very unique tinfoil & tulle bodysuit on Pam Hogg's spring lookbook, and I am totally wearing it at Lisamarie's next garden party! Ok, pause for a second, and imagine my grand entrance. I like how the shoulder pads match the modesty patch down there, but I just hope it's not a bridal dress...now, that would be embarrassing! Is this really, a Ready-to-Wear collection? Ready to wear, where? See, what I just did? Well, it's still better than American Apparel's bodysuits!